Gaetan received a complaint about kids on bikes jumping on stuff in front of City Hall. Chatting with these great kids, he found out they watched cool bike tricks on TV but had no place to go. Gaetan then developed a project to build a Bike Park. He proposed to use vacant land under the Moody Street overpass. Shortly after, using discarded concrete pipes and donated lumber, the Bike Park was being built using local resources. Gaetan was also inspired by dedicated Rotarians looking for hands-on projects in the community. So the city partnered with the Rotary Club to get work done. 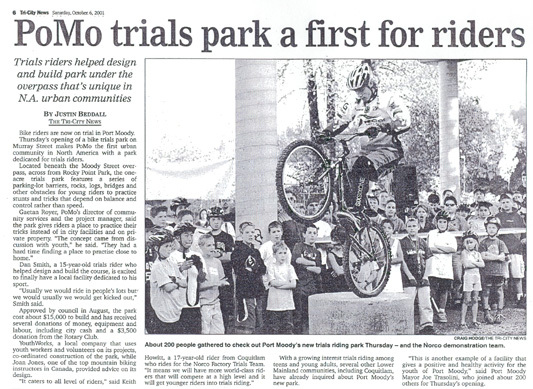 The Rotary Bike Park was born out of community involvement. It was inspired by you. This being a first in North America, the City received an award. The kids who inspired the popular Rotary Bike Park continue to inspire Gaetan. It just takes a leader who is willing to listen to what they have to say. If one feature distinguishes Port Moody more than anything else, it is being, living, breathing and showing off as the City of the Arts. 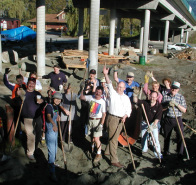 Gaetan was introduced to Port Moody's incredibly dynamic arts community in 2000 when volunteers were starting to assemble our city's Cultural Strategic Plan. This visionary plan was later used as a reference point by many other cities. Port Moody residents and business owners understand the economic value of creative industries. Investors, businesses and their employees are attracted to places where people value the higher things in life: performing arts, galleries, outdoor concerts and bold exhibits. Gaetan believes that we can capitalize on our reputation as a city that offers a sophisticated lifestyle in beautiful natural surroundings. Rather than focusing exclusively on condos and retail space, we can attract high-technology companies, academic institutions, marine research facilities and clean industries that offer high paying jobs. We need to engage Port Moody residents in exploring these options. The people who inspired Gaetan to run for Mayor are ready to offer thoughtful and creative ideas: if only we take the time to listen. Development pressure is the reason being used for rushing to approve the city's Official Community Plan (OCP). In Gaetan's opinion, development pressure is exactly why we need to take the time to add numbers in our plan and spell out in a clear and measurable way the kind of growth we are ready to accept. The next four years will be a critical time. Rushing forward with a flawed plan is just plain wrong. Gaetan Royer offers a better plan for Port Moody.